Why wait for a class when you can learn basketry, gourd crafting or chair caning when you are ready. You'll have access to our tools and supplies as well as our experienced staff of craft artists to help you. Work at your own pace and experience the joy of learning a new skill. Be challenged, knowing that there is an expert in the room with you when you need help. Fee: $40 for 5 hours which can be spread over two days, if you prefer. Please call ahead to reserve a spot and tell us what you'd like to do. We try to limit the number of students to two persons per day, so you can get more attention when you need it. The ability to twist, twine or braid fiber into cordage allowed indigenous cultures to tie their world together. 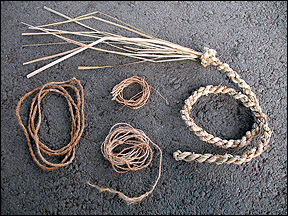 Learn the various techniques of gathering, preparation, extracting and plying of different plant materials to create cordage. Practice the efficient method of leg rolling dogbane fibers. The skill to ply plant fibers into cordage led to the creation of woven cloth and the textile arts. We'll make a small looped string bag using our newly made cordage as the beginning foundation for the bag. Due to the limited amount of time, we'll continue and finish the bag using commercial cotton cordage that has been colored with natural plant dyes. The looped string bag will look similar to the bag in the photo. Baskets are found all over the world in various cultures. They serve utilitarian uses, such as gathering, transporting and storage, as well as aesthetic purposes. 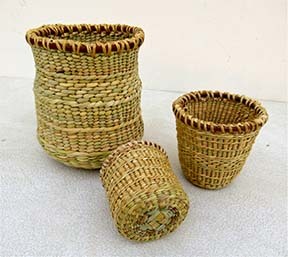 Experience the ability to create a basket from sedge and rush plants. You'll learn three different twining techniques that were found in native baskets of the Central Valley of California. Harvesting, processing and preparation methods will be discussed. Come and enjoy a day of making a twined basket out of plants from the marsh. 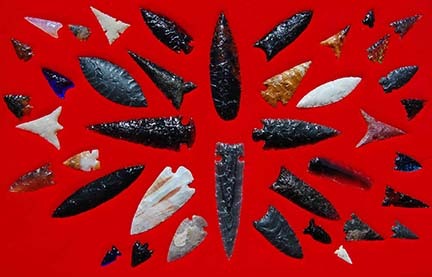 In this introductory class you will participate in a 2.5-million-year-old tradition of making tools from stone... our most ancient technology! Beginners will learn about the different types of stone used to make tools, and will receive a basic knapping kit to learn and take home. Stone to work on (obsidian) will also be provided. Bring along eye protection and leather gloves, if you have them. Students must be at least 16 years of age.